Welcome to the BlueBehavior events and workshops leveraging the most recent facilitation materials available. Optimizing true cross-cultural collaboration where all backgrounds strengthens the high-performing team. Careful delegation through questions and empathic listening towards meaningful conversations and robust alignment. Open space to address any and all leadership questions related to QHSE - Quality, Health, Safety and Environment. The actual topics are chosen by the participants within the first 15 minutes of the session! 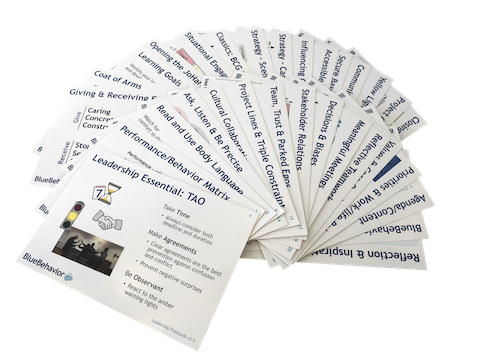 Each bootcamp’s topic is made relevant by shared cases and further experienced through dialogue, smart games and a supporting base-line of 2-3 leadership postcards. Each bootcamp’s cards have been carefully selected from BlueBehavior’s extensive library that has been successfully deployed in high-risk leadership development projects all around the globe.